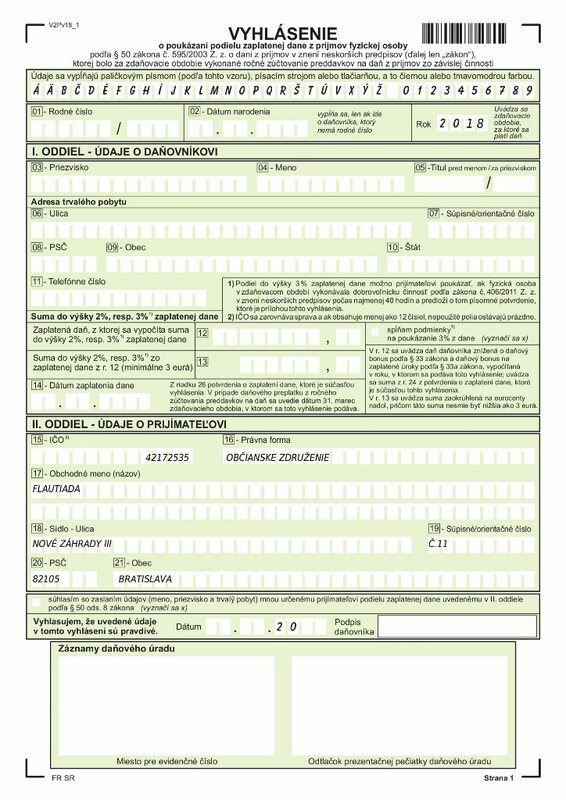 Detailed electronic entry form and confirmation of bank payment of application fee 70€ for active participation, resp. 35€ for passive participation (such as teachers, parents, etc.) is to be send online – the application form is available from 1st December 2018 on www.flautiada.sk. The application fee is not refundable. The deadline for both documents is 28th of February 2019, after this date no further applications will be accepted. The participant is obliged to study and play one of the obligatory pieces for the first round of the competition and respect the top time limit for the optional piece in the second round. The participants are obliged to respect strictly the age limit for each category (age limit reached till the day of competition). Qualified pianists can be provided for the competition – the fee 35€ will include one 30 minutes rehearsal before each round., 5 minutes acoustic rehearsal in the concert hall and the stage performance. Competitors can provide their own piano accompaniment at their own expense, in such case however the 35€ passive fee is to be paid. All competition fees will be used to provide organization expenses of the competition including rehearsal rooms, meals and refreshment. Traveling and accommodation costs are to be carried by the participants and their own accompanists themselves, the reasonably priced possibilities of accomodation available in Banská Bystrica will be recommended by the organizers later.